Wondering whether a hurricane will affect your town is a good question but one that can’t be accurately answered on a seasonal basis. Every mile of the U.S. Gulf and East coast is vulnerable to a hurricane, but there are locations that have higher odds of being hit any given year. 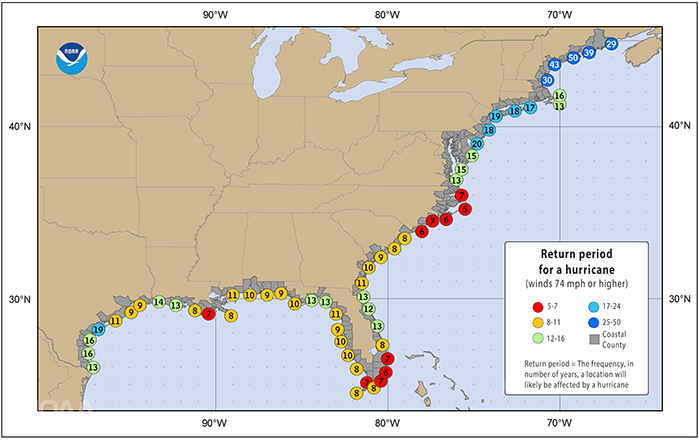 NOAA’s National Hurricane Center uses an analysis tool that quantifies those chances called the hurricane return period. It’s the frequency at which a hurricane can be expected to pass within 50 nautical miles of a specific location. For example, a return period of 20 years for a major hurricane means that on average during the previous 100 years, a Category 3 or stronger hurricane passed within 50 nautical miles of that location about five times. Looking forward one could expect five Category 3 or stronger hurricanes within that 50 nautical mile radius during the next 100 years. 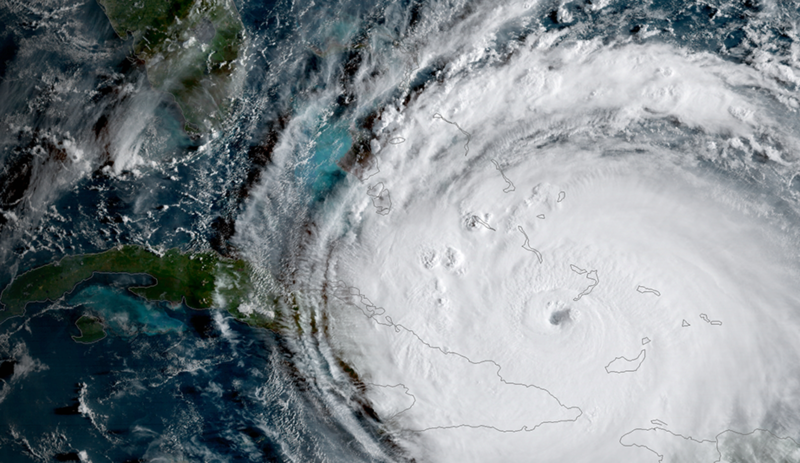 “Regardless of the odds, everyone living or vacationing in a hurricane-prone location has to be prepared” says Ken Graham, National Hurricane Center director. How does your location fare? Take a look at the maps shown. The first map above depicts the return period for a hurricane of any category on the Saffir-Simpson Hurricane Wind Scale, the second map below is for a major hurricane (Category 3 and higher). The areas with the highest return periods for a hurricane of any category are coastal North Carolina, South Florida and Southeast Louisiana, about every 5 to 7 years. Coastal New England has the lowest return period at 30 to 50 years. For major hurricanes, the return period is longer. 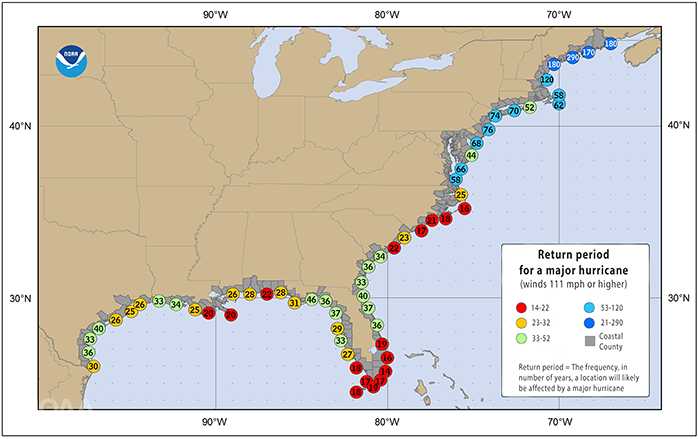 To take a deeper look into historical hurricane tracking data, NOAA’s National Ocean Service provides an online tool that allows users to track the paths of historic hurricanes. It also provides links to detailed reports on the life histories and effects of U.S. tropical cyclones since 1958, with additional U.S. storm paths traced as far back as 1851.